The installation of package bees is one of the easier beekeeping tasks. 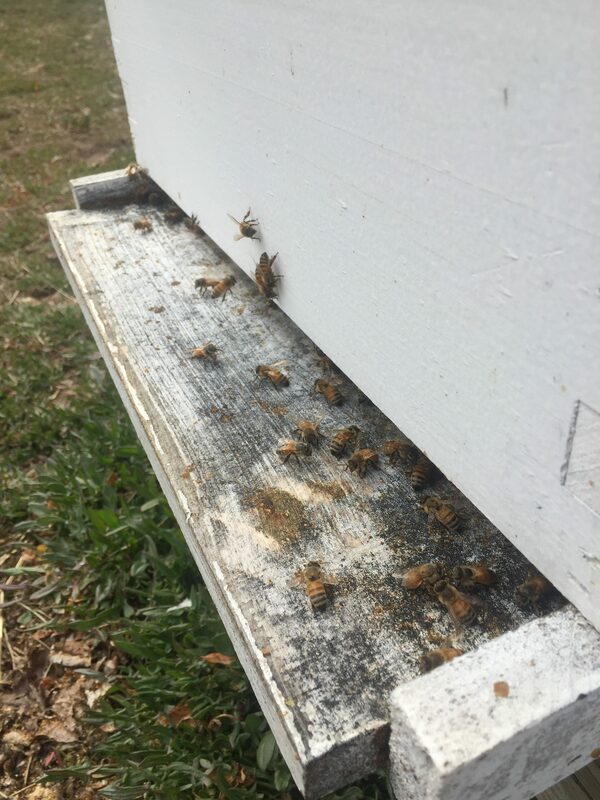 Whether installing in a hive with drawn comb from a deadout or in a new hive with undrawn foundation, it only takes a few minutes. The next few weeks, however, are crucial. Getting your package off to a good start can determine whether your colony builds successfully throughout the season, eventually overwintering, or your colony struggles all year, eventually succumbing to disease, robbing, cold winter temperatures, or some combination of all three. I installed five packages as part of Stonewall Apiary’s package installation demos on Saturday, April 8 and Sunday, April 9. Because the packages had been shaken so recently, I waited until Tuesday, April 11 before removing the metal caps on the queen cages. 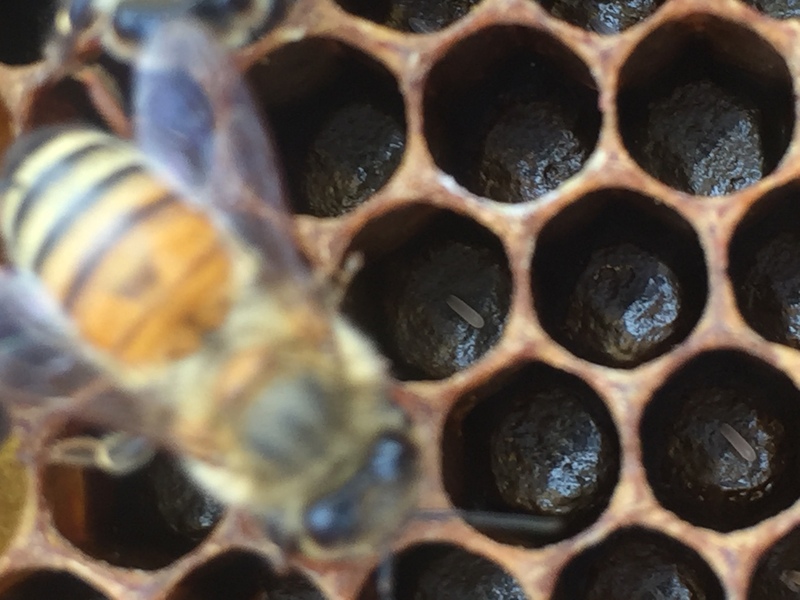 After removal, the package bees could start chewing through the candy plug to release the queen. This process can take a few days, but sometimes it’s as little as 24 hours. Leaving the cap on the queen cage gives the package bees a little more time to get used to the new queen, helping to boost the likelihood of queen acceptance. 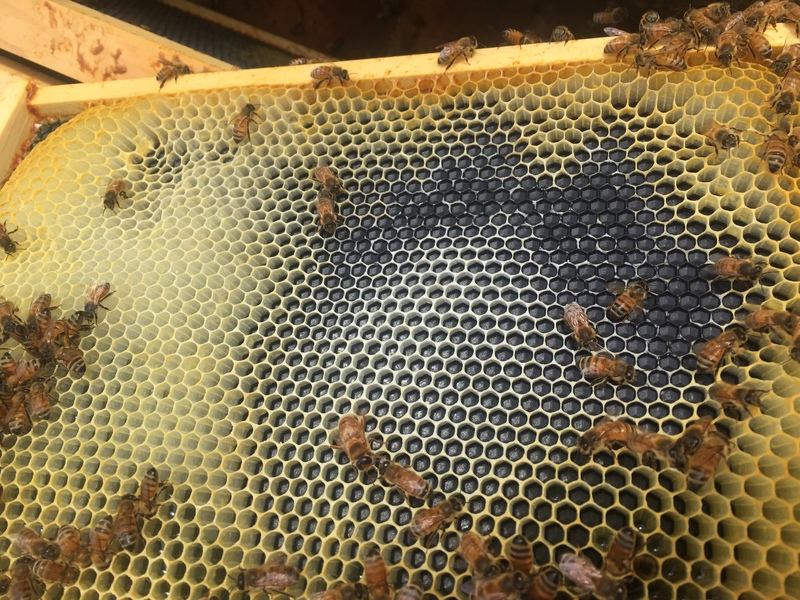 Once the cap is removed, it’s best to leave the hive alone for a week, since disturbing hives with newly-introduced queens can cause them to kill the new queen. 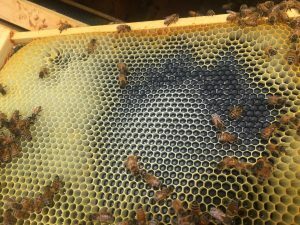 Still, I had a little time on the weekend, so I decided to check out one of the hives to see how things were progressing. 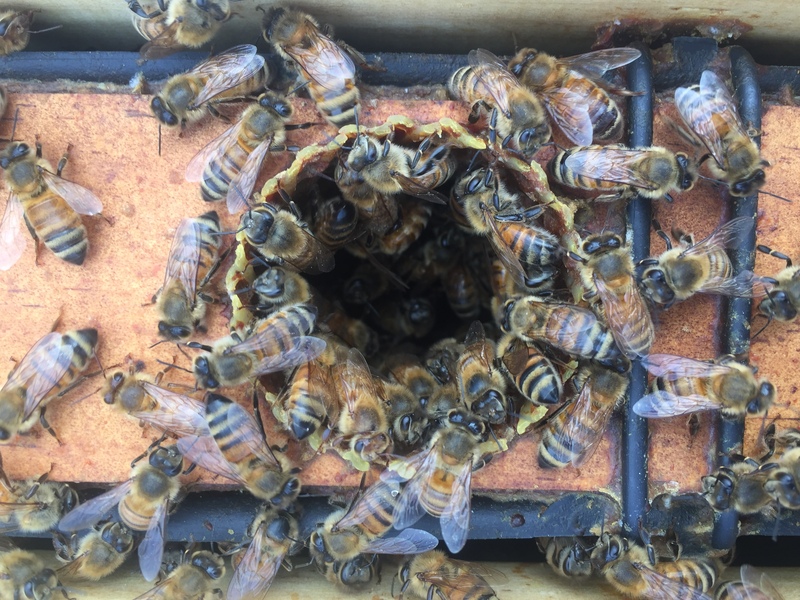 The entrance of a hive with newly-installed package bees. Whenever I inspect any hive, the first thing I check is the entrance. Are bees going in and out? Does it look active? This hive looked fine. It was a warm afternoon and bees were flying in and out. If it hadn’t been a single deep, I would have said it looked like most of the other colonies in this apiary. Opening the inner cover of a hive with newly-installed package bees. Opening the inner cover, things again look good. The bees are eating the half pollen patty I gave them, as well as the 1:1 sugar syrup. After a light application of smoke, they’re docile – ignoring me for the most part. Taking out a frame, I notice plenty of new wax. Patches of bare frame are starting to be built out. Areas with older and darker wax have a thin layer of light wax on top. These bees are putting the syrup to good use! A gallon of syrup consumed in three days. Storing syrup and nectar, and pollen. Not all the syrup is going to wax production. 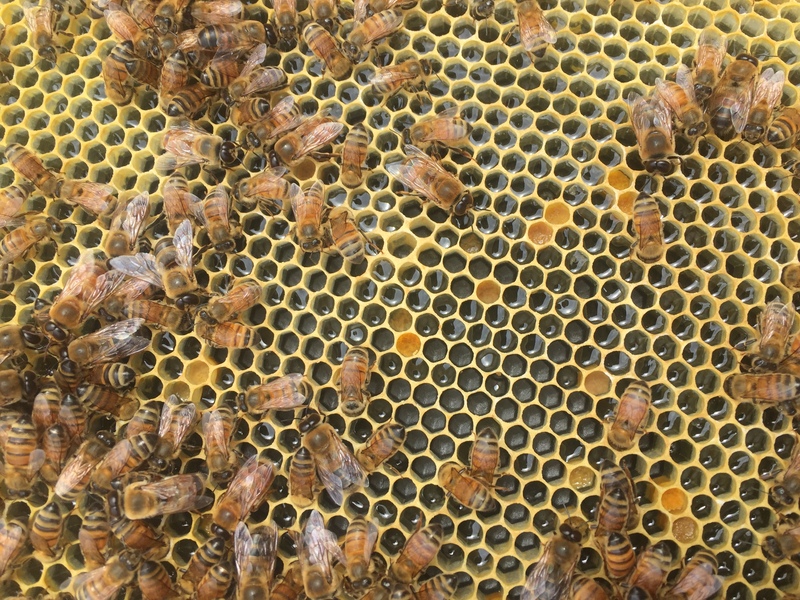 In this frame, the bees are storing syrup and nectar in many of the cells, plus pollen. They’ve gone through a gallon of syrup in three days. They’re getting ready to build up! Now, has the queen been released? RELEASE THE KRAKEN – er, I mean, THE QUEEN! The candy plug has been consumed and the queen has been released from her cage. So she got out. But did she survive? That’s the next question that needs answering. Fortunately, the answer is yes. The queen is out and the bees around her are grooming her and otherwise attending to her needs. They’re not attacking her or chasing her around trying to kill her. That’s good news. But is she laying? Eggs at the bottom of the cells. This queen is definitely laying, but she started quite recently. There are only a few eggs in small patches, and the patches do not exhibit a good brood pattern. I’m not worried. 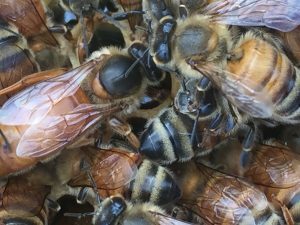 This is common for newly-released queens. When I check again in about a week, I’m confident she will have gotten the hang of things. I expect there will be large areas of eggs and small larvae on several frames, with nearly every cell filled. So what now? Before I closed up the hive I refilled the feeder with syrup. I’ll keep filling it until they stop taking it or the second deep is nearly full. I’ll also give them a second half pollen patty in a day or two. Other than that, I’m going to mostly leave them alone for a while. I’ll briefly check that the brood nest is expanding each time I inspect and feed, and as long as that’s happening I’ll leave them alone. 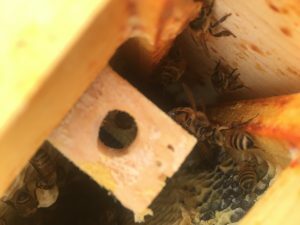 And while I always have my eye on mites, this is a new hive with no brood so I’m not overly concerned. 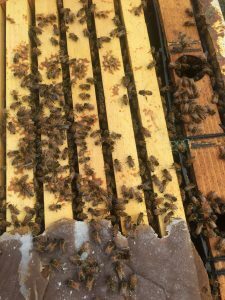 As they go through multiple brood cycles and the brood nest expands, I’ll be checking for mites carefully during my inspections, not to mention testing. There’s definitely a formic acid treatment in their future this summer, plus other treatments after that. But for now things seem off to a good start with this hive. 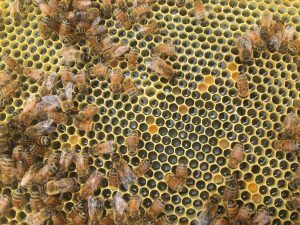 With good management and a decent fall nectar flow, I wouldn’t be surprised to harvest one or even two supers of honey from this hive.